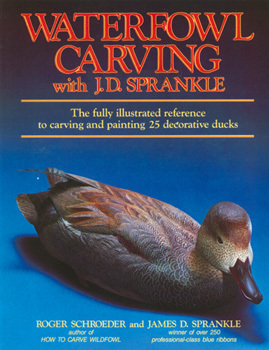 This excellent book is the fully illustrated reference to carving and painting 25 decorative ducks. Written by award-winning carver J.D. Sprankle, the reader is taken through the step-by-step process of carving a beautifully colored gadwall drake. Nearly 250 photos (including a full-color section) show the drake coming alive and the accompanying text discusses the technique in a lively, interesting manner. Also included are photos of other birds in various stages of production as well as patterns, eye sizes, and painting instructions for 25 birds: gadwall, black duck, baikal teal etc., which should help the carver build up a mastery of shaping, texturing and burning techniques. This informative guide is a must for any would-be carver of waterfowl, or carver in general.